Jean-François Champollion was a French scholar, philologist and orientalist, known primarily as the decipherer of Egyptian hieroglyphs and a founding figure in the field of Egyptology. A child prodigy in philology, he gave his first public paper on the decipherment of Demotic in 1806, and already as a young man held many posts of honor in scientific circles, and spoke Coptic and Arabic fluently. 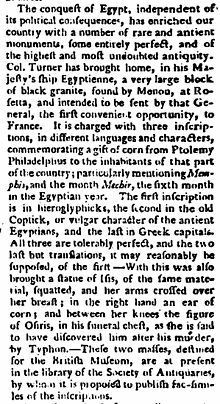 During the early 19th-century, French culture experienced a period of 'Egyptomania', brought on by Napoleon's discoveries in Egypt during his campaign there (1798–1801) which also brought to light the trilingual Rosetta Stone. Scholars debated the age of Egyptian civilization and the function and nature of hieroglyphic script, which language if any it recorded, and the degree to which the signs were phonetic or ideographic. Many thought that the script was only used for sacred and ritual functions, and that as such it was unlikely to be decipherable since it was tied to esoteric and philosophical ideas, and did not record historical information. 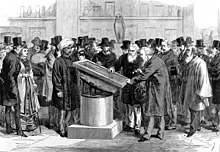 The significance of Champollion's decipherment was that he showed these assumptions to be wrong, and made it possible to begin to retrieve many kinds of information recorded by the ancient Egyptians. 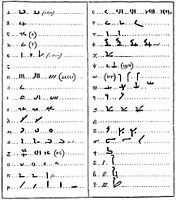 Demotic is the ancient Egyptian script derived from northern forms of hieratic used in the Nile Delta, and the stage of the Egyptian language written in this script, following Late Egyptian and preceding Coptic. 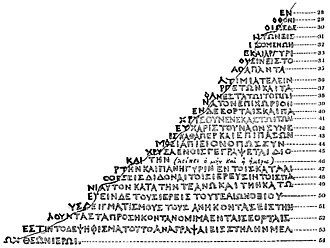 The term was first used by the Greek historian Herodotus to distinguish it from hieratic and hieroglyphic scripts. By convention, the word "Demotic" is capitalized in order to distinguish it from demotic Greek. Johan David Åkerblad was a Swedish diplomat and orientalist. The decipherment of Egyptian hieroglyphs was gradually achieved during the early 19th century. 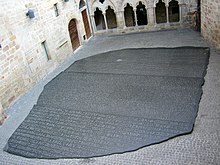 The most helpful clue was supplied by the discovery in 1799 of the Rosetta Stone, an inscription in three scripts. Building on work by several other scholars, notably Thomas Young, the breakthrough to decipherment was made by Jean-François Champollion. 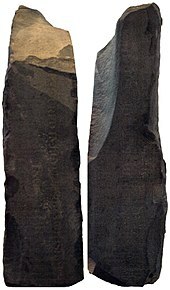 The Philae obelisk is one of twin obelisks discovered in 1815 at Philae in Upper Egypt. It was discovered nearly intact, while its twin had broken into pieces in antiquity. Both were soon afterwards obtained by William John Bankes, an acquisition which included an important bilingual inscription. The Graffito of Esmet-Akhom is the last known inscription written in Egyptian hieroglyphs, dated to 394 CE. It is inscribed in the temple Isis at Philae in southern Egypt. The ancient Egyptian Man-prisoner is one of the oldest hieroglyphs from Ancient Egypt. An iconographic portrayal from predynastic Egypt eventually led to its incorporation into the Egyptian language. Not only rebels from towns or districts, but foreigners from battle were being portrayed. Lettre à M. Dacier is a scientific communication in the form of a letter sent in 1822 by egyptologist Jean-François Champollion to Bon-Joseph Dacier, secretary of the French Académie des Inscriptions et Belles-Lettres. 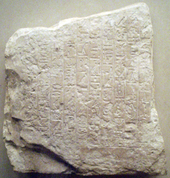 It is the founding text upon which Ancient Egyptian hieroglyphics were first systematically deciphered by Champollion, largely on the basis of the multilingual Rosetta Stone. The Decree of Memphis is the third Memphis decree, the first being for his grandfather Ptolemy III (Decree of Canopus), and the second being The Raphia Decree . The Decree for Ptolemy V is the text recorded on the Rosetta Stone in the Egyptian hieroglyphs, Demotic (Egyptian) script, and Greek.